​- typically in association with botanical gardens, art schools or universities. then courses are listed alphabetically by town within the state. This page is still a work in progress. Listings include all courses open to the public i.e. excluding all those which are "members only" courses run by botanical art societies. If any listed are the latter please let me know and I will remove them. PLEASE READ FIRST: I do NOT respond to or provide any information in response to queries about courses already listed and provided on this page or in links for courses on this page. Please direct queries to the organisers. Botanical Art Classes in 2019 - There is an extensive listing of botanical art classes delivered at Filoli. It is not necessary to enroll in the Botanical Art Certificate Program to participate in these classes; however, prerequisites must be completed. Reputable botanical artists, botanists and tutors providing tuition at centres in Colorado. 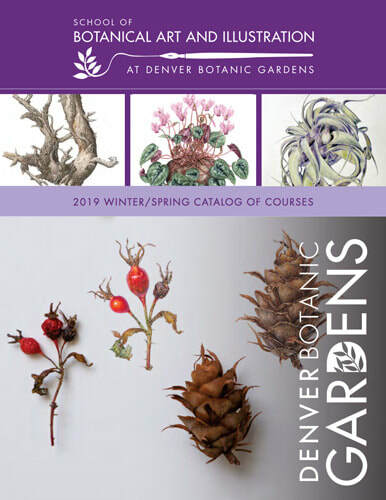 The Certificate Program offered by the Denver School of Botanical Art and Illustration was created in 1990 (see Diploma and Certificate Page). The School also runs a very extensive range of short courses and has a very active blog. The school is open for everybody, both for committed illustrator and enthusiastic amateur. Café Botanique - free lectures for Botanical Art and Illustration students, Gardens' members, the general public, academia and artists together to discuss botanical science, research and art. Reputable botanical artists and tutors providing tuition at centres in Illinois. The certificate program consists of seven core courses, designated required courses within each track below; a choice of 60 instructional hours of elective courses; and a portfolio review. There's a very clear statement of requires courses and which require a pre-requisite course. All requirements for the certificate must be completed within five years of the start date of the first course in the program. Interesting this certicate has a twin track approach to the elective courses - one which is biased towards the traditional approach to botanical art and the other which allows a more expressive approach. Introducing Heeyoung Kim's Botanical Art Program at Brushwood Center, 2019. The program includes watercolor, graphite pencil and ink from beginner to master level. ​Scientific Botanical Illustration: Begonias BAC 19 213 | Tutor: Jeanne Kunze | Dates: 6 Friday mornings: April 5, 12, 19; May 3, 10, 17 | Hours: 9:30 a.m. – 12:30 p.m. 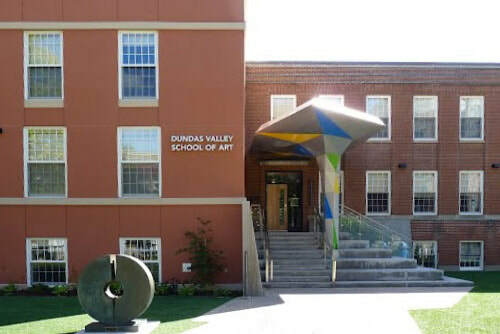 The school also offers year round classes. ​The range on offer appears to be excellent and covers various topics delivered by a range of tutors skilled in different media. They include courses for both beginners and people with prior experience. They can be followed one at a time or as part of a structured programme leading to a certificate. Distance learning ONLINE courses in Botanical Illustration provided. Complete all three courses and get a Certificate. They make links to past students' blog posts and portfolios available on the website. A comprehensive syllabus document is available for each course (PDF file) - covering both content and books and materials required. Botanical Illustration I: Basic Drawing Techniques (limited to 20 students) Next class: Late May/early June 2017 View full syllabus [.pdf] Enrollment limited to 20 students. Botanical Illustration II: Working With Watercolor (limited to 12 students) Next class: Late May/early June 2017 View full syllabus [.pdf] Enrollment limited to 12 students. Botanical Illustration III: Advanced Techniques Next class: Late May/early June 2017 View full syllabus [.pdf] Enrollment limited. Classes are taught by NCBG staff, and other area art and botany professionals. This course adopts the modular approach and students need to register for each course which makes up the certificate on an individual basis. the Botanical Illustration Certificate Handbook [PDF]. List of Spring 2016 Botanical Illustration Certificate Classes [PDF]. Courses run by members of the Philadelphia Society of Botanical Illustrators (PSBI) are listed on their Classes Page. October Pen Illustration Workshop with Lara Call Gastinger Friday, October 19th or or November 9th 2018, 9am to 12pm. Reputable botanical artists and tutors providing tuition at centres in Canada. ​Link in name is to their website. Nature Drawing - Six Saturdays, Jan 12 & 19; Feb 2, 16 & 23; March 9 9:30 a.m. until 12:30 p.m.
Coloured Pencil technique Six Wednesdays January 30- March 6, 9:30 a.m. until 12:30 p.m.
however the personal information of those recommending courses and the homes of tutors will NOT be shared. Note: I securely retain your name details supplied for 12 months after the course is complete. I may check with you to see if you are running the same course the following year - but only if this is unclear online. Banner Image: Illustration of a Lilium superbum Linn. from American medicinal plants; : an illustrated and descriptive guide to the American plants used as homopathic remedies : their history, preparation, chemistry, and physiological effects.